A Unique large historical villa by the sea for your holiday or destination wedding in Portugal. Book Now your beachfront villa for 2015. Perfect location for your holiday and wedding. Your Sea Themed Wedding in 3 steps! 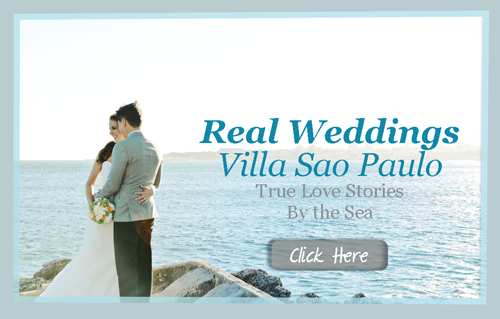 If you are looking for a special Wedding Villa for your wedding by the sea or a large Holiday Villa by the Beach, then Villa Sao Paulo - Beachfront Wedding Villa in Portugal is the place for you! The Villa Sao Paulo, a large historical villa, has all facilities you'll ever need within a walking distance: beach,supermarket, pharmacy, hairdresser, coffee shop, bars and restaurants, train line to Lisbon and more. Less than 30 minutes away from Lisbon Airport﻿. Choose the perfect venue for your dream wedding. You have to come to Villa Sao Paulo and indulge yourself in this incredible and exclusive wedding venue by the sea. Stunning views and plenty of sunshine all year round. Even for winter weddings, Villa Sao Paulo is the best Portugal wedding venue for you﻿. Choosing the perfect destination for your special beach wedding or holidays can be an extremely difficult decision. Getting married in Portugal is the perfect choice! In Portugal, we can provide your basic desires in Villa Sao Paulo, an amazing Portugal wedding venue with help from our wedding planners team.